Since I started writing this blog, I’ve wanted to write a post on the differences between digital and non-digital games. I’ve spent a lot of time working on both, so I’m in a unique position to compare and contrast how they’re designed and what they can do. Truth be told, I tried writing on this topic months ago, but was overwhelmed with how much I had to say about it. Digital and non-digital games have a surprising amount in common–in fact, most game design books recommend that designers develop paper prototypes of all games, even when the final product will be a digital game. That said, there are so many subtle differences, it can be difficult to know where to start when comparing the two. So, to try to help me manage the comparison and help you digest it, I’m going to break this post into several parts. In the first part (that’s today! ), I’ll discuss the biggest difference between digital and non-digital games: the computer. Largely, I’ll be discussing how this empowers digital games, since computers are so much better than humans at doing many types of processing. In the next part, I’ll discuss that the amazing processing powers of a computer don’t actually open up that much game design space, even though it seems like it should. In the third and final part, I’ll address some surprising advantages that non-digital games have because humans are doing the processing, and how design space can actually open up when a computer is not overseeing the game. Of course, this is just the tip of the iceberg, and I’m sure that I’ll discuss more issues related to digital versus non-digital games in the future. But you have to start somewhere, and I’ll do that today with a discussion of the magnificence of our new digital overlords! It might come as a huge surprise, but the biggest difference between digital and non-digital games is that digital games harness the power of computers to do most of the work a game requires. Computers have made a huge difference in all areas of our lives, so it’s no surprise that they have taken games to a whole new level, making the game industry one of the most profitable and powerful entertainment industries in the world. Brains: bad at math and get bored easily. Compared to many other types of entertainment and art, games actually take a lot of work. Something has to set everything up before a game starts and clean up the pieces when the game is over. Something has to connect players and contain the playing field and the pieces. And most importantly, something has to know all of the rules and make sure they’re followed. Traditionally, humans have been burdened with all of these tasks, with only the aid of a few pages of rules. The problem is that humans are really bad at a lot of this stuff. Human memories are fragile and inaccurate to say the least. Many humans are terrible when it comes to understanding systems, and few enjoy or are good at math. Humans also get bored and frustrated pretty easily. At the end of the day, this means that non-digital games take a lot of work to learn and play, limiting who is willing to play them and putting serious constraints on the complexity non-digital games can employ. Computers have really helped in this regard. Computers have vast and nearly perfect memories. 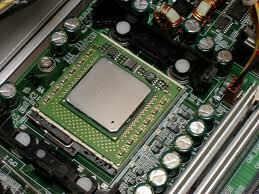 At their cores, computers are mathematical engines, and can perform thousands of calculations a second. Perhaps best of all, they never get bored: computers are happy (or something like it) churning through millions of lines of instructions over and over forever. They’re also great at things like setting up a game instantaneously and taking care of mundane tasks (like shuffling cards) without complaining. With the advent of the internet, it’s even possible for computers to find you other people to play with anywhere in the world at any time! All of these benefits boil down to two things. First, it means that playing games on a computer is much faster and more convenient than the non-digital alternative. Take Risk for example. Playing the non-digital version of this game is an exercise in patience, usually involving hours of back and forth between players, each turn requiring countless die rolls and many computations to figure out which side won a particular battle. I used to enjoy the game, but in middle school, my friends and I discovered a digital version. Now, instead of painstakingly collecting and counting dice to determine a battle, we just had to click on one country, click on another country, and we instantly discovered who won and how many soldiers survived the bloodshed. Instead of laboring for hours to determine the outcome of a single game, we could play two or three games in an hour. You might say that some of the value was lost in the transition between non-digital to digital, but it’s undeniable that the games were much more convenient. Civilization: the board game that couldn’t exist without computers. Second, games can become much more complex. As a first example, take a game near and dear to my heart, Civilization. In many ways, Civilization is simply a glamorized board game: in it, players create pieces and move them around a grid to claim territory and fight battles. It turns out that the original Civilization was inspired by a board game, and the game could theoretically be played with cardboard. However, practically speaking, it would be impossible. The game is simply way too complex, and the number of game pieces and events is too vast for someone to keep track of. Even if someone were somehow capable of managing it all, the game would quickly turn into work and lose its fun. It’s only because the computer can take care of the grunt work and leaves the player to worry about playing the game that the game is enjoyable (and it is!). Computers allow for scaled up, less hassle games in the style of traditional board games, but they also open up new types of experiences with their speed and computational power. Take Tetris as an example. Tetris is a classic puzzle game involving blocks falling from the ceiling with increasing speed, while the player has to sort and order them. 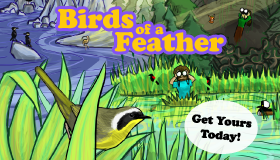 The game is fairly simple, but incredibly compelling. Could a game like Tetris be played without a computer? Definitely! It would just lose a lot of its appeal because part of what makes the game fun is the real time aspect to it: the game continues to function with or without any activity from the player. Eventually, the game is too fast and frantic for even expert players to handle. Without a computer to manage it, the game would have to be turn based, which would totally kill the frantic aspect, or a non-player human would have to manage the game, something that sounds both imperfect and boring. Without a computer, Tetris wouldn’t be a game that anyone would have heard of, let alone enjoyed. 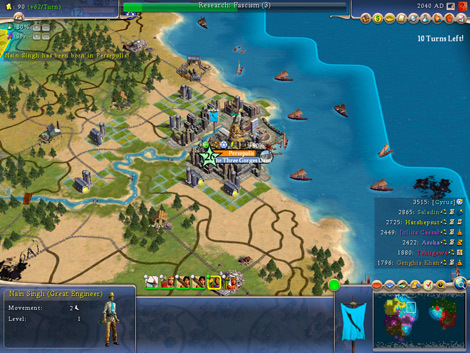 Computers can also simulate incredibly well, especially physics, which opens up new types of gameplay. Computers are so fast, they can simulate many complex and real time systems almost perfectly. While I could use countless games to illustrate this, from Super Mario Brothers, one of the first games to make excellent use of physics as the focus of play, to a game like Counter Strike, I want to talk about Portal instead. Portal features play with unusual physics, but I actually want to discuss it because the game could really do away with a lot of what the computer provides, except the physics. 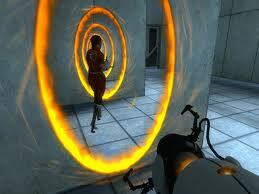 Portal makes use of physics for gameplay that couldn’t exist without a computer. For those unfamiliar, Portal is a first person puzzle game focusing on the player’s ability to create two portals, allowing him or her to travel or send other objects between them. The player has to use the portals to overcome a series of obstacles throughout the game. If you haven’t played it, I highly recommend it, as it has a lot of great character. For those of you who have played it, ask yourself: does the game need to be real time? Does it need to be continuous, or could it get away with taking place on a discrete grid? Does the game even need to be first person? I think the answer to all of these questions is no. While all of those features add to the game, and the game designers made excellent use of them to contribute to the play experience, it would have been possible to play the game as a series of boards, where the player decides which grid space to put the portals in and how to move through them. Again, not all of the puzzles in the game can be simplified like this, but I think most could. So, why wasn’t a game like this made? The physics would have had to be simplified too much if a human, rather than a computer, was executing them. The game still could have been interesting, but it would have been much less interesting. Without the computer present to perform the countless computations needed to model a physics system in a way that’s tolerable, the game just wouldn’t have been Portal. Computers have added a ton to games. From a game design perspective, I think that allowing for real time gameplay and much more advanced simulations are the biggest unique advantages, but that’s not even touching areas like artificial intelligence (something that is criminally underutilized) or aesthetic concerns like brilliant graphics and animation or music and sound effects, which games completely lacked before computers. Clearly, digital games have a lot of offer that non-digital games could not even dream of. That said, there are still many limitations. 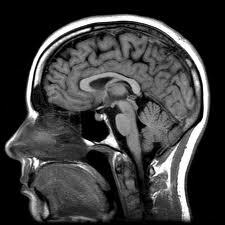 Join me next time when I discuss how the limitations of humans get in the way once again to level the playing field. Update: Part II is now up. Another Update: Part III is also up. “From a game design perspective, I think that allowing for real time gameplay and much more advanced simulations are the biggest unique advantages…” umm, hello, Hungry Hungry Hippos is some fast-paced real time adventures. Good point! Actually, there are lots of non-digital games that delve into this territory, from pinball to foosball. But I guess these all start to verge into sports territory. And speaking of which, why isn’t Hungry Hungry Hippos in the Olympics! ?